Thank you all for the tremendous discussion on yesterday’s post with some insights on the Plateau de Beille stage. As usual, whatever doesn’t come out in the post is brilliantly debated in the comments and discussion afterwards, so thank you for the thoughts and opinions! Most of the discussion has been around the issue of the 2011 Tour tactics and strategies, and particularly what this implies for doping (or a lack thereof) in the sport. That is obviously a big talking point – it is implicit in what we are seeing, to the point where I actually tried to avoid mentioning it in the post because I’d rather focus on the racing. But of course, it’s a big issue, and it’s also a positive thing for cycling to suggest that the sport is moving in the right direction, so worth discussing. And so I felt the need to do this post, somewhat reactively, in order to provide some context to the debate and to my interpretation. What one has to really understand is that sporting performance is so incredibly complex, that when you watch a competitive sports event (and this is true of any sport, incidentally), so many factors affect the outcome that taking a “reductionist” approach will always be incomplete, and sometimes very misleading! That is, if you reduce things like performance and racing tactics to being the result of only one variable (in this case, the presence of absence of doping), then you are invariably over-simplifying things. This is not necessarily a bad thing – simplifying a problem is often the first step to building an understanding of it! And if you do it systematically, then it’s actually the only way to work towards understanding a complex phenomenon like performance. But it’s important to acknowledge the complexity and recognize that there’s no proof in performance alone, only context. And I do think it’s valuable context, particularly if you can adopt a systematic approach, and ask yourself “What would the sport of cycling look like WITH doping?”. Make a list of characteristics that you would expect to see if the best athletes doped. And if you know that, then you can find signs (not proof, take note) that suggest otherwise, that the sport may be getting cleaner. But I’ll post more on this tomorrow, when I’ll do some “Rest day questions and insights“. The biological passport – what is it and how does it work? I guess the ultimate question about the passport is “Does it work?”. It had a bad rap initially, mostly because people are saying it’s caught so few riders, despite suspicion. There are reasons for this, but I’d argue that actually producing positives is only a small part of doping control. Allow me an analogy. Say you have a stretch of road that is known to be a high accident zone as a result of speeding – guys hit 100 mph in the 70 mph zone. Authorities might decide to install cameras to catch people speeding. They might estimate that in a given week, an average of 500 cars speed through this section – it’s impossible to know the precise number, because it can’t be documented without the camera. Having installed cameras, they review the statistics and find that they are now catching 2 speeding cars per week. A failure? Are they looking in the wrong place? Not necessarily, for the obvious reason that as soon as drivers know that the risk has increased (provided they also believe that the punishment will be enforced if they offend, of course), they modify their behavior accordingly. This is an obvious and simple example that just because the passport is not catching doping cyclists, it may actually still be exerting an effect on the professional peloton as a result of what I would crudely describe as “fear” that this new system can catch dopers. Doping behavior would thus be modified as a result of awareness, and the end result is that authorities might catch FEWER transgressors, but should still feel content that they’re getting a problem under control. But, you are not going to just take my word for it (nor would I expect this! ), so let’s look for some evidence. If the cyclist is changing their behavior in response to the increased chance they will be caught, then you can expect to see changes in the markers that reveal the EFFECTS of doping. In other words, you apply the Biological Passport concept, and investigate whether things are changing. The green blocks show abnormal samples where reticulocyte percentage is HIGHER than normal – either 2 to 2.4% (light green) or above 2.4 to 5% (dark green). Remember that a higher reticulocyte % means more immature blood cells, suggesting EPO use or blood removal. So quite clearly, in 2001 and 2002, you had a high percentage of samples that suggest EPO use – between 9% and 11% of all samples, and 80 to 90% of suspicious samples. No surprise there – this was the era of EPO use. So clearly, the EPO test changed things – from 2003 to 2007, between 6% and 10% of samples had low reticulocyte %, and these tests make up 80 to 90% of the abnormal test results. Remember, this suggests blood doping, and a shift in practice after the EPO test was introduced. 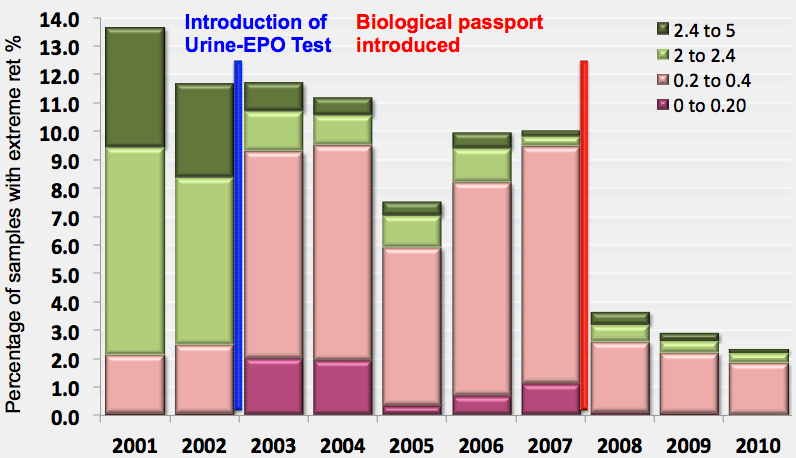 Then comes the Biological Passport, shown by the red line in 2008, and immediately, you see a substantial drop in the total number of tests with abnormal reticulocyte %. This is clearly a good finding, because only 4% of all tests have unusual reticulocyte percentages, a drop from 14% in 2001. That’s an enormous impact, and while it does not prove that doping is reduced, it does suggest that the Biological Passport has had a measurable and expected impact on the sport. And there is the “elegant” timing where the introduction of a test first shifts the trend from high ret % (EPO use driving RBC formation) to low ret % (blood doping which suppresses RBC formation) and then seems to bring it right down. This strongly suggests that professional cycling has adjusted its behavior in order to avoid detection, not once but twice – the first was a change, the second a reduction. The threat has therefore induced change. But there is more to this – it’s linked to performance, and that’s what the Tour data suggest. That optimism comes in part from this graph, from testimonies within cycling (I honestly believe that cyclists are “nervous” of the science behind the Passport), and of course, performance. And so that’s why when the climbing times are down, when the power outputs drop, when the physiological implications of those power outputs are suddenly “credible” based on what we know about physiological capacity, when the racing is more conservative, when attacks are less frequent, when groups are more bunched, my interpretation is that the sport is moving in a positive direction. The physiology, the marker for doping, says that doping behavior has changed. The performances confirm it, and even though each of those things by themselves proves nothing, they mount the evidence, confirm the hypothesis and all in all, I think they portray a positive message! That’s the context then. Into the future, a rest day tomorrow, and maybe a good time for some questions – what will the last week bring? So join me for some insights, where I’ll try to talk racing as well, not just the doping, because there is a fabulous climax to this Tour on the horizon, much to look forward to!